Just Drive – April is Distracted Driving Month. 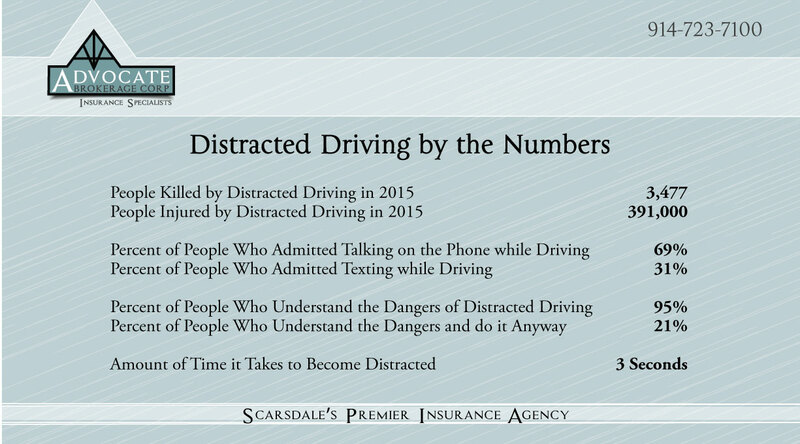 - Scarsdale Premier Insurance Agency | Advocate Brokerage Corp.
Just Drive – April is Distracted Driving Month. Traffic accidents are quickly on the rise and distracted driving is a key reason why. According to the National Highway Traffic Safety Administration in 2015 alone 3,477 lives ended and 391,000 injuries can be attributed to Distracted Driving. While we all know the dangers of driving distracted, there are approximately 660,000 drivers using cell phones while driving during daylight hours each and every day. That creates a substantial increase to the risks for each one of us. We would encourage all drivers reading this blog to Just Drive! Do all of the things you know you are supposed to do: wear seat belts, use car seats, follow the speed limit, plan ahead, and above all…don’t hold your phone on your lap. It is just too tempting to resist the ringing, buzzing or vibration of a cell phone.